Around 17,000 years ago, Lake Victoria more or less completely dried out. I still find this absolutely staggering. In fact, the lake has dried out and reformed at least 3 times since it first formed about 400,000 years ago. Lake Victoria is the largest lake in Africa and indeed the tropics, containing 2.75 cubic kilometres of water (though compared to the 2,850,000 cubic kilometres of water in the Greenland ice sheet that seems small, which merely goes to prove how much of our fresh water is locked up in the ice sheets), making it the 9th largest lake by volume in the world. 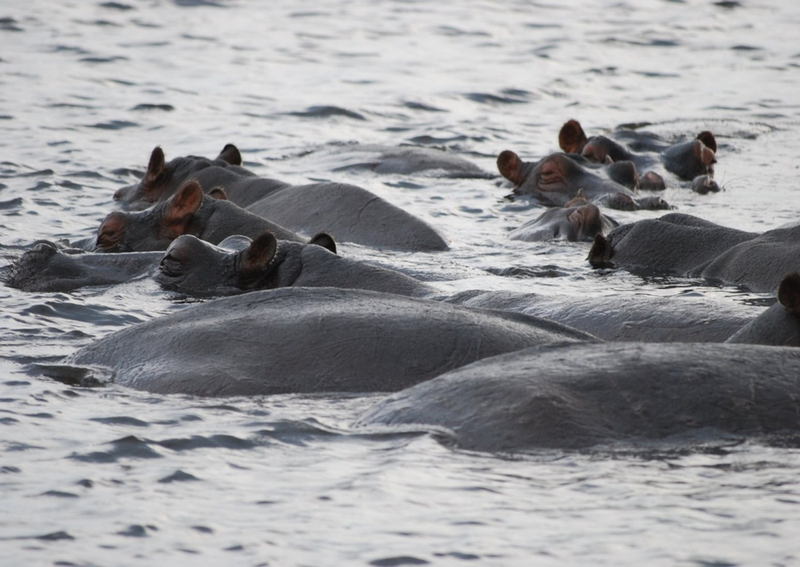 Gratuitous wildlife shot: A raft of hippos chilling out in the river. Clearly, the disappearance and later reappearance of the lake, and others in the region speaks to monumental shifts in the climate. The East African Rift Valley lakes are largely fed by the East African rains, long and short, delivered by the shifting position of the Intertropical Convergence Zone as the Earth’s seasons change bringing those life-giving rains. This grant proposal started as idle speculation around the coffee machine (in the grand old scientific tradition) about how this was climatically possible and could it happen again? My colleague (and talented PI on the proposal) Peter Thejll had been reading a book about John Hanning Speke and Richard Burton (not that one) and their famous search for the source of the Nile and has some personal African connections, which prompted the conversation and it seemed obvious to try and find out what happens to the local circulation to allow the lake to dry out. A quick google search revealed an old friend, Dr. Sarah Davies at Aberystwyth University was researching this topic actively and it all fell into place. Now, I can guess what you’re thinking – this is usually a glaciology or Arctic Climate blog, where on earth has all this Africa stuff come from? Well what happens in the Arctic does not necessarily stay in the Arctic. There are a number of hypotheses as to the drivers of these changes in African rainfall, among which is the interesting observation that the periods of greater aridity correlate remarkably well with Heinrich events in the North Atlantic. 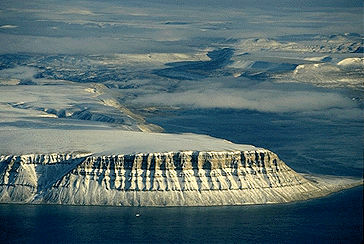 Heinrich events were first identified as layers of sediment most likely transported into the North Atlantic Ocean by icebergs, known as ice rafted debris – IRD. The southerly position of many of these layers thousands of kilometres from any ice sheets either at the present day or in the past suggests a truly extraordinary amount of icebergs and cold fresh water were discharged over a relatively short period of time, from a large ice sheet. The source of these sediments is most likely the gigantic Laurentide ice sheet of North America, but there is also some evidence of smaller contributions from the British and Fenno- Scandian ice sheets (which may or may not have been joined together across the North Sea depending on how you interpret the evidence). The physics behind this is that as the enormous amount of cold fresh water was discharged into the North Atlantic, the temperature and salinity changes were sufficient to push, or keep the ITCZ far to the south, preventing the rains one East Africa. On the other hand, other research has linked the failure of the rains to El Niño and related phenomena such as the Indian Ocean dipole and the Walker circulation. Still other scientists have noted that these drying periods seem to correlate with orbital changes in the earth which would affect the seasonality, that is the annual cycle of seasons. It is known as orbital forcing as the Earth’s seasons are driven by changes in our orbit around the sun (have a look at the excellent Orbit documentary from the BBC for a very easy to follow and beautifully filmed introduction to the importance of our orbit around the sun if you’re not familiar with Milankovitch cycles etc). Milankovitch cycles shown from ocean cores and an Antarctic ice core at the bottom compared with the theoretical cycles. All of these hypotheses can be supported by correlations with palaeo evidence, but to really disentangle the connections between different regions of the world and how they affect each other’s weather and climate, we need to use a climate model. Luckily, at DMI we have the perfect tool to hand, a global climate model including ice sheets, EC-Earth. 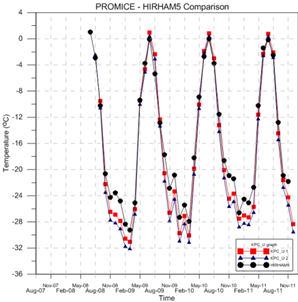 Furthermore we also have a high resolution regional climate model, HIRHAM5, my usual tool of choice. Our friends Morten Dahl Larsen and Martin Drews at the Danish Technical University are experts in using hydrology models so the answer is obvious. We want to use these model tools and an extensive archive of observations, helpfully curated by our project partners Sarah Davies and Henry Lamb at Aberystwyth University to test all these different ideas. As an extra spinoff from the project, the Aberystwyth group have been intensively involved with the collection and analysis of a new lake sediment core from Chew Bahir in Ethiopia, so it’s going to be pretty exciting seeing if we can get the models to replicate these kind of records. There is of course an extra urgency to this project. It’s not just a somewhat obscure academic question. A recent paper showed that the long rains have significantly reduced over the last decade, and about 300 million* people live in this region and rely on these rains for drinking water, hydroelectric power and agricultural production. During this period we have also seen rapid changes in the Arctic. Of course the two trends may not be connected, or may be linked via a common third factor which is why the physics of climate are so important to understand. UPDATE 2: I had no time originally in the writing of this to add a little about our other project associate. One of the best things about doing science are the very smart and friendly people you meet along the way. Social media has really helped here to keep in touch as it is a nomadic lifestyle. By sheer chance I noticed a familiar name in a tweet that seemed to have some direct relevance to the proposal as we were writing it. John Marsham was an old friend from my student days at Edinburgh University who I had slightly lost touch with. Thanks to the efforts of facebook we were soon back in touch and he is one of the Investigators on the HyCRISTAL project, part of the hugely important Future Climates for Africa Project, funded by the Department for International Development (DFiD) and the Natural Environment Research Council (NERC) in the UK. DACIA has some really obvious parallels with this project, though where we would like to concentrate on past climates, they will be focusing on present day and future climates. We hope therefore to send our PhD student to collaborate with the HyCRISTAL and FCFA projects where our insights from palaeomodelling palaeodata can make a real difference to the way future climate change is adapted to in East Africa. 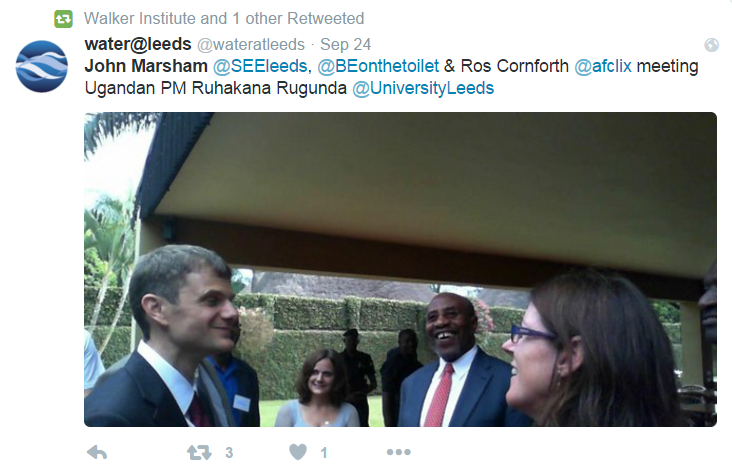 It will be very nice to collaborate with John’s group at Leeds as well as the Aberystwyth group, now we just have to hope we get the money to do it..
Or, to put it another way, “bless the rains down in Africa” ** (As an aside, for years I had always heard this as “I miss the rains down in Africa”, assuming it was about someone from Africa who missed being there). *(based on a back of the envelope calculation based on population statistics from Wikipedia if you know the correct number do let me know). A slightly different topic today – not purely scientific but rather a purely opinion piece. Happy National Poetry Day! Today is National Poetry Day in the UK and I stumbled across an article on the Guardian website by Britain’s Poet Laureate, Carol Ann Duffy. In it she argues that science and information is not enough to convince people of the problem or solutions to climate change. There is, she suggests much work to be done on an emotional or aesthetic level. As part of the Guardian’s “Keep it in the ground” campaign she has therefore curated 20 poems from different writers especially commissioned on the subject. I think it’s a very intriguing idea. I have never been a subscriber of the idea of “two cultures [pdf]”, most scientists I know are well read, musically gifted, artistically inclined, culturally engaged and often all four together. So, if the poem a day gets people excited, engaged and somehow involved in understanding and solving the problems of climate change I am all for it, especially with the summit in Paris coming up in December. And the miles-deep shag ice makes its move? I used this in my PhD thesis and like to think that it is about the glacier I did my PhD work on, Breidamerkurjokull in Iceland. The photo below was taken in 2005 at the end of my last field season in Iceland. As a final farewell we took a plane flight over the glacier. In retrospect I wish I’d done it at the start as many processes and features we’d puzzled over became clear when viewed from above. The 3 lobes of the glacier are clear in this picture (though the ice in the foreground is from a different glacier, Fjallsjokull), the lake with icebergs in the far background is the famous Jokulsarlon, a popular tourist site in Iceland and also, incidentally, a popular film location. 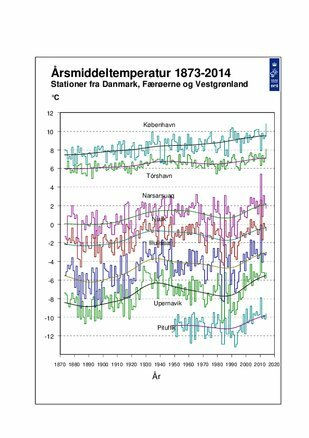 My 2 kids were singing the rain rain go away rhyme during last weekend’s epic rainfall in Copenhagen and it reminded me that I have not yet put up a post about a paper I was a co-author on this summer related to late summer/autumn rainfall and the effects on the Greenland ice sheet, so here goes…. Mostly when we think of precipitation in Greenland we think of snow in the winter, but it does rain quite a lot, as I know from personal experience (see photo taken as the clouds started to clear one September field season in Eastern Greenland…). 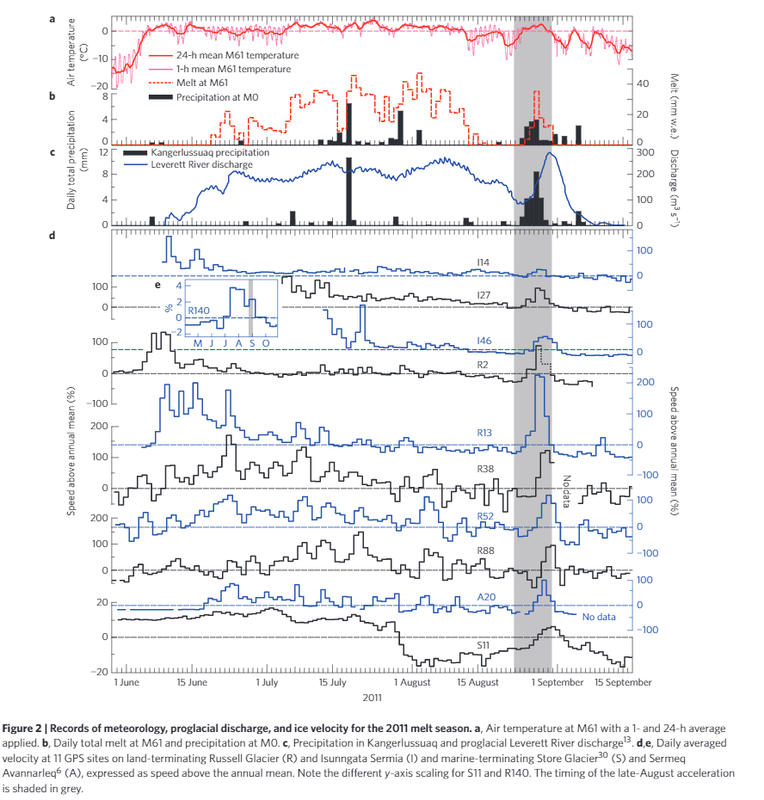 This paper in Nature Geoscience by Sam Doyle and co-authors including myself shows that when rain falls on the ice sheet at the “wrong” time of year it can have a very far-reaching effect, causing the speed up of a large area across the ice sheet. 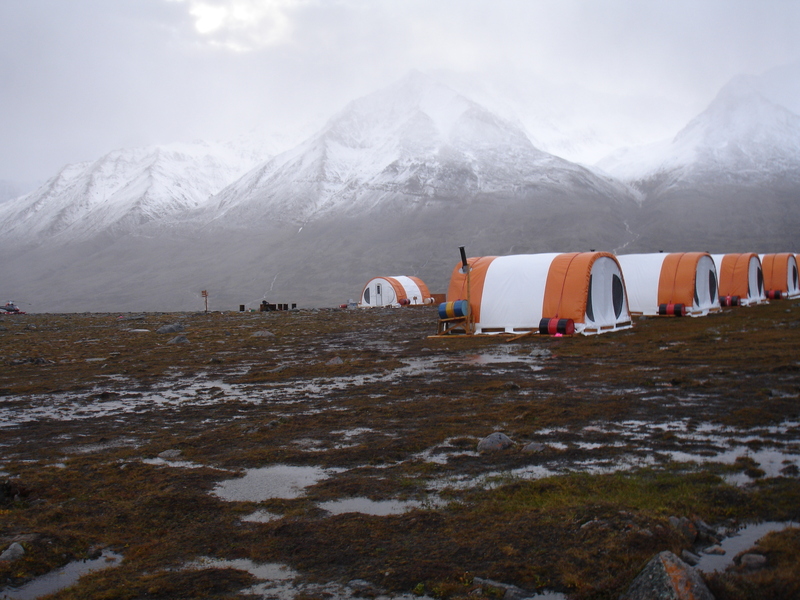 Exploratory mining camp tents in the foreground. The important caveat is that rainfall during the main part of the melt season is more or less evacuated away quickly. Glaciers – and the Greenland ice sheet is basically a very big glacier – develop a drainage system more or less analogous to large underground sewers during the melt season. These tend to close down during the colder accumulation season and reopen by the sheer pressure of water running through them when the melt season starts. 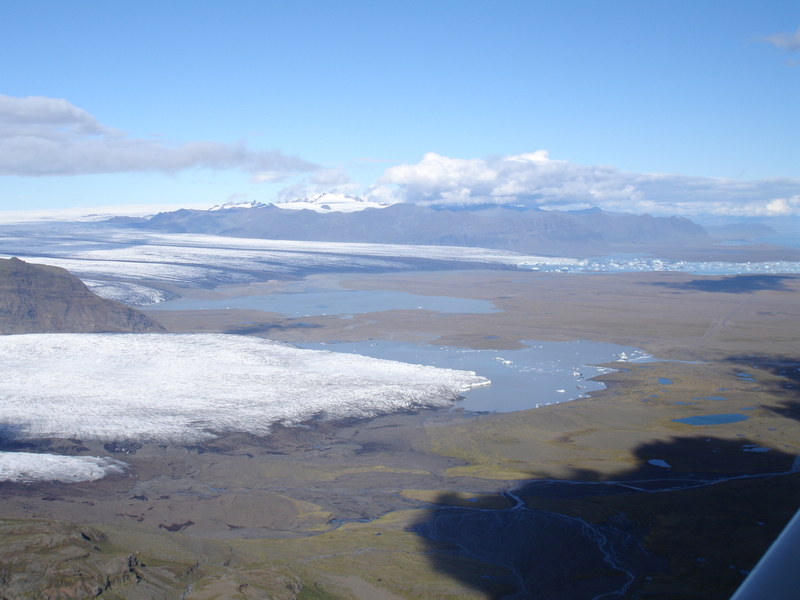 Rainfall during that crucial late summer/early autumn period when the drainage is closing down and therefore less efficient at evacuating surplus liquid water is therefore not able to move away from the glacier very easily and forces its way through any way it can find. During this period, most of the snow will have melted off the surface, leaving vast areas of bare ice. By contrast, rain on snow in the early part of the melt season when there is a thick snow pack is more likely to refreeze inside the snow. In late summer however, there will be a relatively short period between rain falling and accumulating in the glacier drainage system. 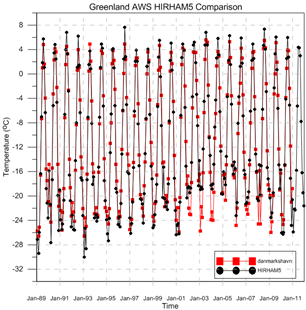 My contribution to the paper was in the form of some HIRHAM5 model runs for Greenland which show the last decade has seen a significant increase in rainfall events in the summertime compared with the previous decade. We chose as a study region the K-transect of weather stations in western Greenland. These are operated by Utrecht University and have a long time-series of data which previous work has shown our model can replicate quite nicely. The model is forced by the ERA-Interim reanalysis, a data set based on weather forecast models with real observations included in it run for the whole world so we are pretty confident the rainfall patterns are realistic. There are actually two interesting points illustrated in the picture below taken from the paper. Firstly that there is more rain falling and secondly that this rain is falling at higher elevations on the ice sheet, potentially causing a much wider area of the ice sheet to be affected by late-summer rainfall events. The decadal change in rainfall events is partly due to a persistent North Atlantic Oscillation anomaly which has funnelled storms over the western edge of the ice sheet. 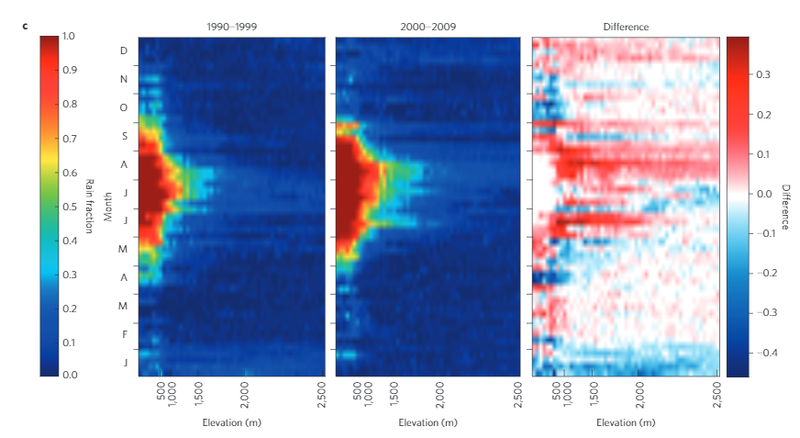 There is also some evidence that the stratospheric Rossby waves have become more “wavy” over the same period, due to the increasing warming and vanishing sea ice in the Arctic. This hypothesis was articulated in a very nice paper by Francis and Vavrus but it remains a very open area of research as we just don’t have a lot of evidence right now. We do know that the Arctic is one of the fastest warming regions on the planet and this will certainly have a knock-on effect on the Greenland ice sheet both in terms of melting and, perhaps, in the frequency of storms bringing rain over the ice sheet in the future. I am now preparing a new study to see if we see a signal along these lines in our future simulations of the Greenland domain. Rainfall events at a weekly timestep over the K-transect in western Greenland for two different decades and the difference between the two. The second decade has many more rainfall events that reach to a much higher elevation than the first decade. Anyway, as I find I am constantly switching between Gigatonnes (or indeed Gigatons), cubic kilometres and sea level equivalent, here is a quick and handy guide to converting different units of mass, for my own use as much as anyone else. 1 gigatonne is 1 billion metric tonnes (or 1 milliard if you like the old British style, that is one thousand million). 1 gigatonne of ice will still weigh 1 gigatonne when it is melted but the volume will be lower since ice expands when it freezes. A cubic kilometre of ice does not however weight 1 gigatonne but about 10% less because of the density difference. 100 gigatonnes of water is roughly 0.28mm of sea level rise (on average, note there are big regional differences in how sea level smooths itself out). EDIT: – thanks to ice sheet modeler Frank Pattyn and ice core specialist Tas van Ommen on Twitter for pointing out I’d missed this last handy conversion. Interestingly and probably entirely coincidentally this is very close to the amount of mass lost by the Greenland ice sheet reported by Helm et al., 2014 for the the period January 2011 – January 2014 (pdf here) of 375 +/-24 km3 per year. Over the last 10 years or so, Greenland has lost on average around 250 Gigatonnes of ice a year (Shepherd et al., 2012), contributing a bit less than a millimetre to global sea level every year with some big interannual variability. This year looks like it will be a comparable number but we will have to wait for the GRACE satellite results in a couple of months to fill in the dynamic component of the mass budget and come up with our final number. Of course, gigatonnes and cubic kilometres are rather hard to visualise so we have skeptical science to thank for this post that tries. And as aside, Chris Mooney wrote a nice piece in the Washington Post on the difficulties of visualising how much ice is being lost which contains the immortal line “Antarctica is clearly losing billions of African elephants worth of ice each year”. As an impressionable seven year old I learnt what a crevasse was; namely a large split in a glacier of great hazard to glacier travellers. This knowledge was imparted by a venture scout in my parents group who, on a climbing trip to the Alps, managed to end up in one, breaking several bones in the process. Years later this did not discourage me from my own forays into alpine mountaineering, so it was probably inevitable that I would have my own brush with mortality in a crevasse while researching them as part of my PhD work (see photo). 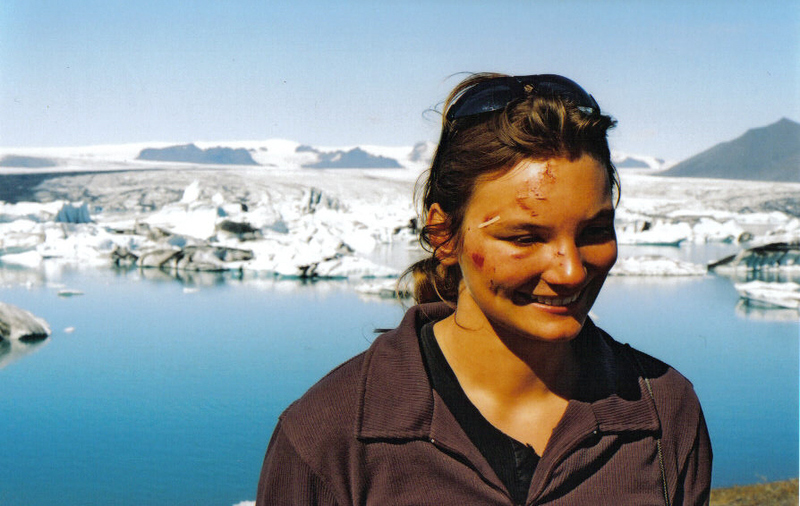 Some injuries, 3 days after falling into a crevasse (thankfully to be rescued by quick-thinking field assistants). The research was interesting and made more so by being carried out in such a spectacular environment. Breiðamerkurjökull is a southern outlet glacier of the Vatnajökull ice cap in Iceland. It’s actually one of the more popular tourist destinations in Iceland thanks to the boats that run on the lagoon in front of the glacier, getting people up close and personal with icebergs. The icebergs are one of the reasons we chose to work there, as the rationale of my Phd project was can a crevasse depth relation be used as a parameterisation for calving in ice sheet models? I was moved to revisit this work recently when a friend (and ace glacier/climate blogger) Liam Colgan posted about crevasse factoids. Crevasses are extremely beautiful features to observe and they are interesting scientifically since they indicate all sorts of information about what is going on in a glacier. As they are aligned more or less with the principal stresses in a particular location we can see where a glacier is accelerating or decelerating, that is stretching or compressing respectively, based on the shape and alignment. They can also be used as a feature to track glacier velocity between two successive images taken from aircraft or satellites. 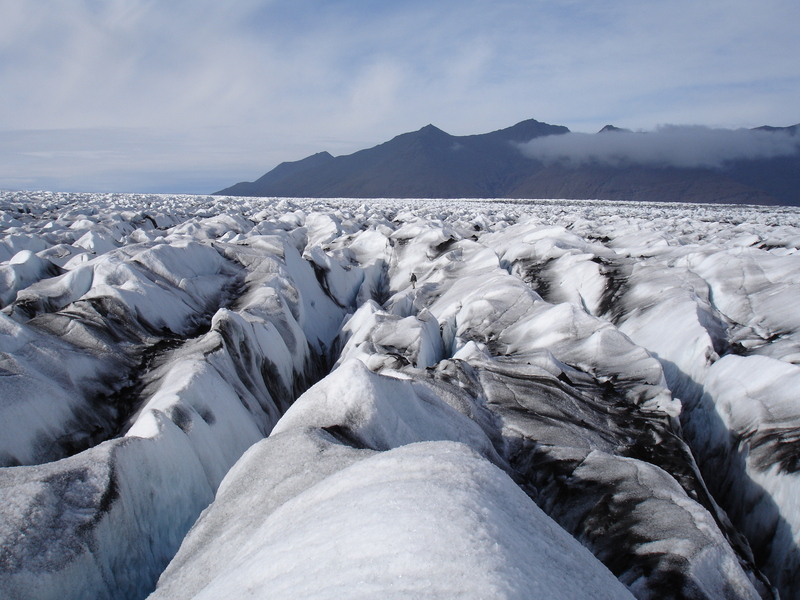 Crevasses are also significant in other ways, since they are a plane of weakness that can be exploited by meltwater, channelling it away from the surface of the glacier to the bed changing the velocity of the glacier. And as proved in the case of my Phd work, when they extend deep enough in the right place, they cause large chunks of ice, namely icebergs, to fall off the front of glaciers. Given all these interesting habits it is probably surprising to learn that the large computer models of ice sheets and glaciers don’t usually include crevasses in them, though there are some more recent honourable exceptions, mostly working with single outlets or small glaciers such as Sue Cook’s work with the Elmer model. This is because an individual crevasse is not only too small for the resolution of a model, it’s also a discontinuity, and the approximations of the physics of ice sheets do not easily allow discontinuities. To put it another way, when we model glaciers we usually assume they are really large and thick fluid bodies, and as everyone knows, fluids don’t crack. This is just another bizarre property of water, and if I get chance I’ll discuss that again in further detail in another entry. But back to crevasses. Now I mostly work with a climate model, HIRHAM5, using it to calculate surface mass balance, that is accumulation of snow and the melt and run-off from the surface of glaciers and ice sheet. However, I am finally (loosely) involved in a project that sets out to finish in some way the work I started as a young PhD student. At DMI we run the PISM ice sheet model, fully coupled with a global climate model EC-Earth as I wrote about in this post. We will also soon be running HIRHAM5 coupled to PISM in order to study feedbacks between ice sheet dynamics and surface climate forcing (mainly in terms of how topography and elevation of the ice sheet affects the surface mass balance). We also intend to participate in the ISMIP6 model comparison project which will compare the results of several different global climate models that also include ice sheets in a realistic fashion. One of the key challenges in getting these running is how to deal with the ocean interface with the ice sheet, both in terms of submarine melt of outlet glaciers (likely a far more important process than earlier recognised) and in terms of calving icebergs. One of our main (and in my opinion most interesting) projects right now, ice2ice has allowed us to employ a PhD student to work on this specific issue. She will be using a similar idea to Faezeh Nick’s model of outlet glacier calving, which in turn was based on a long ago work (pdf) I was part of as a lowly PhD student. By comparing the measured crevasse depths with numerical models I was able to show that simple models can be used as approximations of crevasse depth. That study is still one of the very very few where actual empirical measurements of crevasse depth, strain rate, spacing and other variables were made and compared with model output. One of the problems all modellers face, but particularly in remote regions of the earth like Greenland, is the lack of available independent observational data which can be used to compare with model output to see how well the model simulates reality. I actually spend much more time trying to model the recent past (say the last 35 years or so, almost my whole lifetime), rather than the future. We can compare the model output with specific metrics to assess if the model is representing any particular processes well or poorly. If the latter then clearly we need to do a bit of work to improve it, or alternatively we can gain an insight into how a particular process or system works. This is a gigantic topic to explore and I recommend the blogs Variable Variability from Victor Venema and the Climate Lab Book from Ed Hawkins and Doug McNeall if you really want to get into it. At a recent meeting in Sheffield we had much discussion on using data from Greenland to evaluate how well the different climate models are performing over Greenland. This is complicated by the generally short records and limited geographical coverage of meteorological observations. Often those observations are made in easy to get to places rather than the places we really need them such as the South East of Greenland where most of the precipitation falls. So here is a quick run down of the met observations I do have access to. 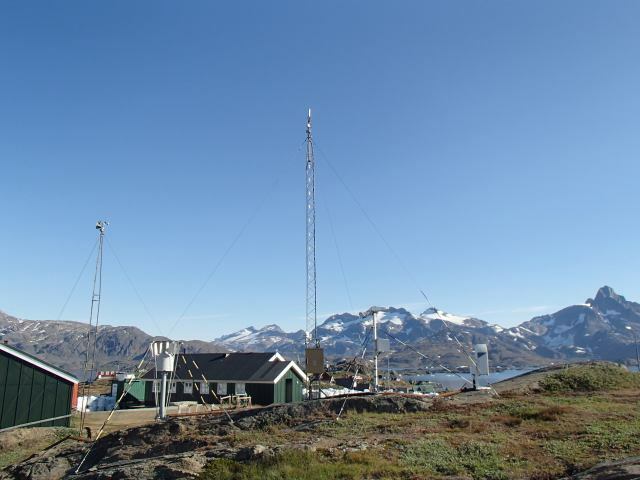 The gold standard of met observations, following guidelines set by the WMO, are the DMI weather stations (pdf ) which are largely confined to the coast of Greenland, plus Summit station at the top of the ice sheet, but have records going back, in some cases, to the 18th century. This data is all publically available and can be downloaded in a zip file from DMI. 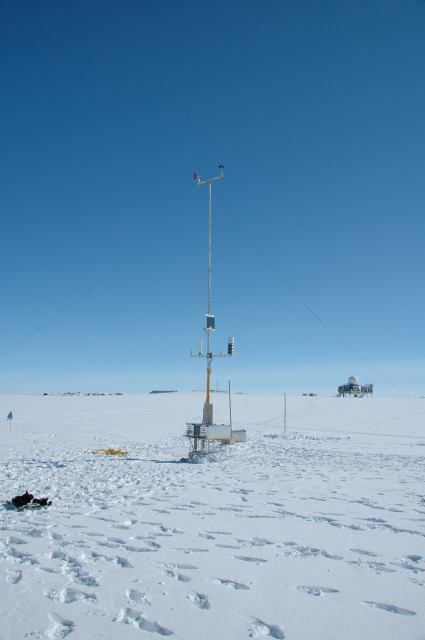 On the ice sheet itself the GC-Net project has set up automatic weather stations on the ice sheet. This data is also pretty freely available, but it does have some quality problems as with any dataset from instruments operating in incredibly tough environments. These instruments are high up on the ice sheet in the accumulation zone, more recently the Danish funded PROMICE project, with whom I work quite closely, have been putting automatic instruments out in the ablation zone. Although these instruments are lower the conditions are also quite tough as the snow and ice under the stations melts out each summer and in some locations the piteraq is also very challenging with 150km/h wind speeds measured during one storm in 2013. The data from Promice goes back only to 2008 but has been quality checked and homogenised so it is much easier for modellers like me to work with and it comes from a zone that is particularly important to understand. As the climate changes we expect the ablation zone to get bigger and melt to increase with some important but difficult to model processes such as retention and refreezing and albedo changes playing a big role in how quickly the Greenland ice sheet will contribute mass to the oceans. 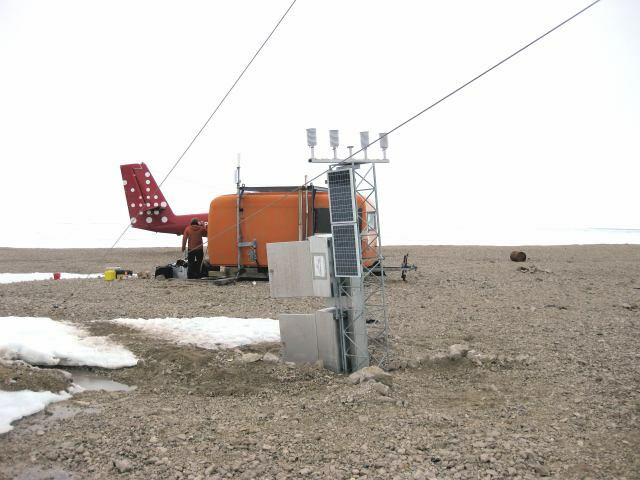 There are of course also a number of other automatic weather stations operated by other projects and agencies, including the K-transect instruments, operated by University of Utrecht IMAU which are also associated with a long time series of mass balance measurements based on stakes drilled into the ice sheet. 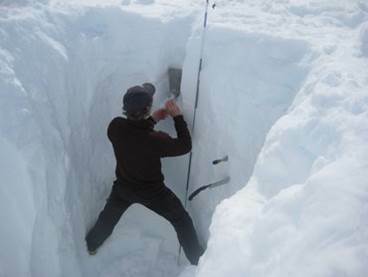 For precipitation measurements, which are notoriously difficult to make especially with blowing snow, we tend to rely on shallow cores and snow pits, though again these are only available in the accumulation zone. This open access paper by our friends at the University of Copenhagen‘s Niels Bohr Institute is a very nice summary of all the measurements available. Unfortunately there are very few shallow cores taken after 2000 and even fewer taken where we need them in the south east. I will end with a plea: all of these measurements are made possible only with budgets that have a continuous downward pressure on them. We rely on them for the weather forecast and for climate research, if you use any of this data do remember to acknowledge it. A lot of time effort and money has gone in to making those measurements, once a station is removed it’s pretty hard to get it back again. When the DMI stations were set up no-one was really thinking of climate change, they were more concerned with shipping and later on aviation and yet we now find them some of the most valuable datasets we have making measurements in a very data-poor region, the Arctic. That is true data gold.